If you own a home with a large fireplace then you certainly know how drafty the fireplace can be in the winter. What’s concerning is the amount of heat that can be lost up through a chimney during the winter when you’re not using the chimney. 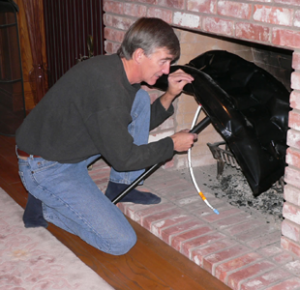 Over the years I’ve seen people try many different approaches to plugging up the chimney to prevent drafts but now there’s a great product on the market that makes it very easy to do. The Fireplace Chimney Draft Stop Plug Balloon sold at Amazon for $55 is a great product for preventing heat loss and drafts in your chimney. The product works very well with different size chimneys and the installation directions look very simple. Without some type of chimney plug in place warm air can rise up and out of the chimney while cool drafty air can blow down through the chimney into your living area. 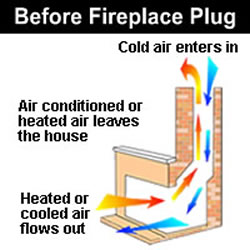 As you can see from the diagrams the Fireplace Plug keeps out the cold air while keeping the warm air inside your home where it belongs. The other thing I like about this product is the support leg that hangs down along with the inflation tube. Both of these help give you a visual reminder that the fireplace plug is in place. 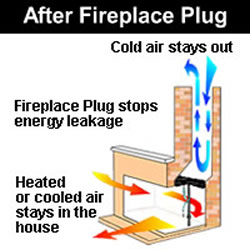 It would not be safe to light a fire with the fireplace plug inside your chimney. With the soaring price of fuel this inexpensive product will surely help you save money heating your home. Does anyone else know of a similar product like this? Any experience with this fireplace plug? Interesting idea, but I prefer the Lock-Top Damper, which fits on top of the flue. The best part is the positive seal which alleviates any concern about heat loss. A steel chain with brass handle hangs down to one side of the fireplace interior, and is easily used to open/close this damper. Definitely saved me after the original mason filed off part of damper (because he installed it too late in the process) when building my Rumford fireplace. The balloon plug seems like it’d be dirty and a hassle to put somewhere when you have a fire…. I’ve ordered the balloon I’ll see how well it performs. I agree that the Lock-Top Damper seems like a better idea. It doesn’t have to be stored and can be closed as soon as you finish your fire. The balloon can’t go into the chimney until it cools down. You do have to store it somewhere while it isn’t in the chimney. Storing it is a smaller issue for me as you also have to store your firewood somewhere and if you can find a place for your firewood you can find a place for the balloon. The problem with the Lock-Top is that the installation is significantly more expensive and difficult. I’ll wait till my balloon wears out and investigate the Lock-Top for when that happens. The balloon is about $60 installed. Without installation the smallest lock-top looks to be $160. While it should last a long time it would take a while to beat out the balloon. There is a couple issues with the lock top dampers. First, they still allow the heated air from your home to raise up into the chimney. When this air cools against the cold damper at the top it sinks back down and creates a cold air draft sensation at the bottom, worse yet if brings down the creosote smells from the chimney. Secondly, when a customer pays $600 to have a contractor come out and put a chimney top damper on their chimney they darn well don’t want that damper creating drafts and smells. So, that customer is back on the phone again with a call-back to the contractor. Let me tell you, that is a real fun call to take. Is the balloon a bit more of a hassle than pulling on the top seal damper cable, yes, but it seals low and tight and does the job. Besides there are more options in balloons than this black style one above. There are clear balloons that are made in different sizes called chimney pillows or chimney balloons. Between the two types you would find a solution that would work. Beware that in some cases it might be illegal to install such devices. For example, if you have a gas fireplace the chimney should always have a path for gas leaks to escape or you’re up for trouble. For wood burning fireplaces it might be OK though. Check your local regulations carefully. @ RU – Thanks…..typically people buy these for wood burning fireplaces.